Internet content creator Hertz has launched a new marketing service called "QR Ebi-sen," which allows companies and individuals to print QR code on shrimp crackers. QR code, a type of two-dimensional code that enjoys widespread use in Japan, connects users to mobile web content when they scan it with a QR code reader-equipped cellphone. 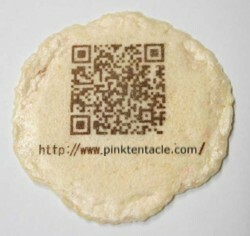 Using natural dye extracted from tamarind seeds, the QR code is printed on the smooth surface of white crackers provided by ebi senbei manufacturer Shimahide, whose factory is located in the city of Kanonji in Kagawa prefecture -- a place known for delicious ebi senbei. The resulting cracker has a high-contrast, high-quality image readable by a cellphone QR code scanner. The price for the service starts at 10,000 yen ($85), with an additional fee based on the number of crackers printed. Visitors to the NET Marketing Forum held at Tokyo Midtown from June 6 to 7 will get the first taste of QR Ebi-sen courtesy of the Web Technology Corporation, who will be handing them out from their company booth. Hakuhodo DY Group i-Business Center and IT DeSign have developed "movie QR code," a type of QR code that incorporates moving video into the design. QR code is a type of two-dimensional barcode that has grown popular in Japan in recent years, because it provides a simple, automated way for users to enter data into their mobile phones. By using mobile phones to scan QR code that appears in an outdoor advertisement, for example, users may be directed to a website containing more detailed product information. To personalize the appearance of printed QR code, which looks like a chaotic arrangement of tiny black and white squares, IT DeSign recently developed "Design QR," which incorporates static images of logos, characters or photos into the code. Movie QR code takes this concept a step further by incorporating moving images into the design, thus optimizing it for use on video screens, where it promises to be more effective in attracting the attention of potential scanners. Seriously, how will anyone be able to resist scanning a bit of on-screen QR code if, for example, it contains a cute, bug-eyed critter that literally begs you to scan it? Movie QR code works just like standard QR code -- any user armed with a reader-equipped cellphone can scan it. 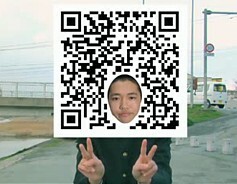 On May 21, the companies plan to launch a new type of advertising service built around the use of movie QR code. Details of the service will be announced soon. Scanning the movie QR code takes you to http://aniful.jp/pr/ (which appears to be accessible only by keitai), where there is a link to another video that contains the answer. For some reason, the Pink Tentacle keitai is having problems downloading that video, so we may never know the truth. Is Black Jack Japanese? Or a foreigner?